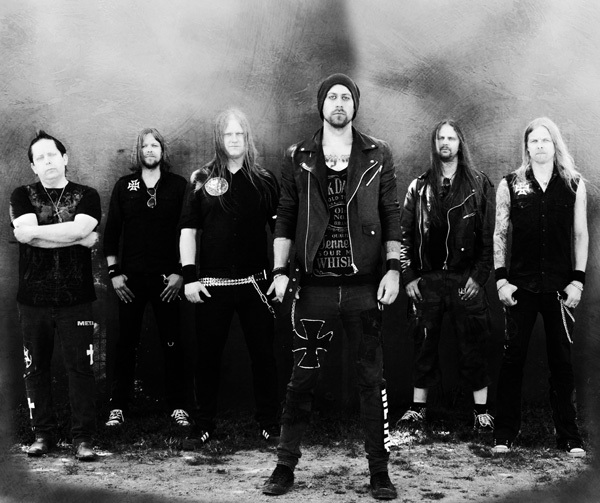 I've been following the career of Sweden's Bloodbound with some interest and heavy metal enjoyment since their inception. If there is any consistent champions of European heavy power metal, Bloodbound is certainly one of them. And in better than 10 years, you would think they would have recorded a live show for CD or DVD, in this digital age. Nope. At least not until this year's One Night Of Blood, a DVD/CD package, from their show at Masters Of Rock MMXV in the Czech Republic. To start, while I will be considering the DVD primarily, all that needs to be said of the audio CD is that it has the same full concert as the video recording. With that out of the way, on to the DVD. My initial observations were, generally, all positive. The film production offers multiple cameras offering multiple views or angle. Like from behind the drum kit to sweeping the crowd, from wide shots of the stage to close ups of individual players, obviously vocalist Patrik Johansson, but also for the lead guitar solos, by example. As for Bloodbound staging, it's minimalist. Large album cover banner for the rear, some standing posters in the foreground, the rest is simply gear. It gives the band a large space to roam as they perform, especially Johansson, who runs about egging the crowd on. As for the sound recording, after several spins, I noticed immediately that two things came to front: the vocals and the drums. Not so much the twin guitars. Yeah. You hear the solos but, as a rule, the twin guitar harmony is somewhat muted, rather than lifted in the mix. Yet, my ears eventually picked up on the guitar lines as I continued to watch and listen. Kudos to vocal mix, picking up Bloodbound's natural two, three, and four part harmony. 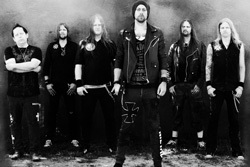 For the songs, Bloodbound hits their highlights across their entire catalog, obviously leaning to the promotion of the current album Stormborn. They all sound great, with my favorite picks being In The Name Of Metal, Nightmares From The Grave, Book Of The Dead, and When The Kingdom Will Fall. Some final thoughts on the DVD show. One, when you compare the overall concert sound to the latest studio recording, Bloodbound sounds rather tame live. Like they left something back in the studio, their epic bombastic edge. Maybe I needed to turn up the volume. Second, as I listened I heard Bloodbound, and unmistakably so. Yet I also couldn't help hearing Edguy, like Mandrake period Edguy, for some reason. The timbre of Johansson's voice perhaps. I'm not sure. Finally, a little bookkeeping. The DVD also contains several videos, live and otherwise. But the best feature is the "Bloody Documentary" where both fans and peers, like Lips from Anvil and the legendary Udo Dirkschneider, are interviewed, then later the band. If anything the video shows the love and camaraderie both fans and bands have for each other and heavy metal. Bottom line: Bloodbound's first live DVD, One Night Of Blood, is bloody terrific. The band is at the height of their career and never sounded better. Recommended. 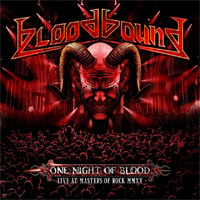 Bloodbound's first live DVD, One Night Of Blood, is bloody terrific. The band is at the height of their career and never sounded better. Recommended.